As Avi notes in his posting, I think Gary McGraw is right when he says: “People keep asking me to join the LinkedIn network, but I’m already part of a network, it’s called the Internet.” It’s also obviously true that the walled gardens are petri dishes growing cultures that will merge with or (some believe) recreate the open Web. So although I don’t spend a lot of time in the walled gardens, I do visit them in order to learn about the cultures growing there. In 2012, what percentage of that year’s class do we think will be participating in Facebook? While we ponder our answers, I’d like to digress for a moment on the data supporting the chart, and on the chart itself. The third term exploits a powerful but little-known and rarely-used feature called numeric range search. In this case I picked a lower limit that I was sure was smaller than the population of any one grade, and an upper limit that I was sure was higher than the population of the whole school. The query finds pages with both of the exact phrases (the quotation of which is another underutilized feature of search) plus a number in the given range. From the result set, I culled two documents. First was the curriculum vitae of Joseph Cifelli, which confirmed that in my era “the high school student population was divided into three houses of about 600 students each.” That’s 1800 total, and there were three grades — 10, 11, 12 — so 600 per grade sounds right. Second was a page on a real estate information site which, though frustratingly undated, I presume to be reasonably current. It gives the student population as 1706. That’s close enough to 1800 for my purposes. The chart itself is the first I’ve attempted using Excel 2007. The process feels very different from earlier versions, but I’m no expert in this area so I can’t make a detailed comparison. I do have a question for Excel wizards, though. In following Edward Tufte’s recommendation to subtract ink wherever possible, I was able to get Excel to remove almost all of the unnecessary cruft: grid lines, tick marks. But there were still a bunch of zeros that were unnecessarily reported out on the long tail of the data labels. I wound up taking a picture of the chart and then using Paint to remove those, in order to achieve what I think is an admirably clean and spare result. Is there a way to get Excel to do that directly? 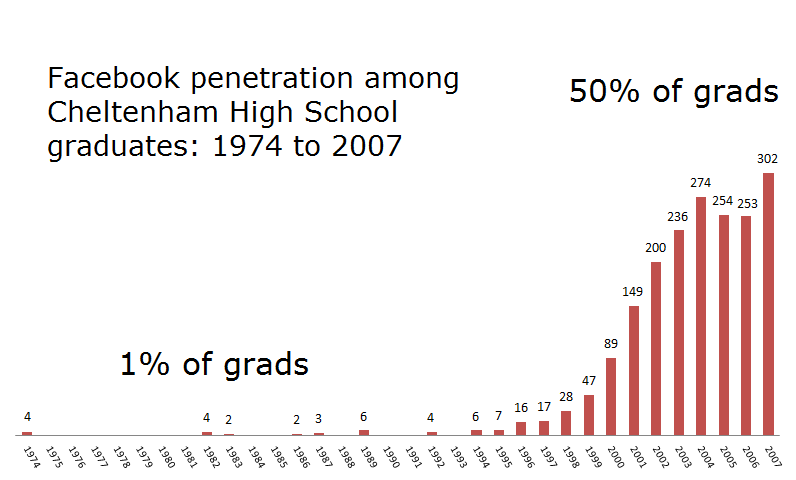 Anyway, back to our question: In 2011 will Facebook’s penetration among CHS grads approach totality? Beats me. That’ll depend on the Facebookization of the Web, but also on the Webification of Facebook. Here’s an example of the latter. Facebook invites me to manage streams of photos and events. But I have other ways to manage streams of photos (e.g., Flickr) and events (e.g., Eventful). Why not enable me to hook into them? The process of diffusion can flow in both directions, I guess, and I hope that it will. Author Jon UdellPosted on 15 Jun 2007 15 Jun 2007 Categories . I’d consider 4 out of a class graduating in 1974 to be pretty exceptional. I graduated from high school in 1991, and out of both of the high schools I attended I’m the only person on Facebook for that year. When I taught my class this last semester I talked about social networks — I use Facebook as an entry point into this because it has almost 100% penetration. Out of my class of ~25 people, everybody but two had a Facebook account, and one of them signed up after my class. I like Facebook okay, but it reminds me a bit too much of the Prodigy/AOL/etc of the late 80s/early 90s — walled gardens, as you’ve said. This is intentional, natch — the networks are supposed to be restricted to folks that are more or less in physical proximity to you — but it still weirds me out a little bit. On your Excel question. I don’t know if I fully understand what you’re asking, but if you have 0’s in the cells in your data for your chart, they’ll show up as 0’s when you show the data. Get around this by just leaving the cells blank. That’ll make it a 0 as far as data is concerned, but won’t make it show up when you turn on data labels. Again, sorry if that’s not what you meant. Note the long dry spell though. It’s not until the class of 1982 that another small clump appears. I should have mentioned the recent introduction of Facebook apps, which Marc Andreessen has analyzed and lauded: http://blog.pmarca.com/2007/06/analyzing_the_f.html. It begins to stitch things together, but geez, there’s a lot to keep track of. Yes, I can go out and get a Flickr Photos app for Facebook and install it into my FB account. But now I’ve got two buckets of photos to manage. Some friends will have photos on both, some one or the other, some on neither. And if my friends want to interact with my Flickr stream in an FB context, they have to add the app into their accounts. I take Marc’s point about enabling third parties to build apps that weave very tightly into FB. Great for innovation. And given the very controlled architecture for integration, great for FB. But as somebody who uses FB and Flickr and Eventful, I don’t want to have to go the apps route, I’d like to just flow FB-foreign photos and events into FB-native buckets. D’oh. It’s exactly what I meant. How stupid of me. Thanks! “…Here’s an example of the latter. Facebook invites me to manage streams of photos and events. But I have other ways to manage streams of photos (e.g., Flickr) and events (e.g., Eventful). Why not enable me to hook into them? Generally no application wants you to go to or use other sites to do anything. The idea is to capture your presence and keep it. Most of this has to do with advertising but also to meet all your needs so you do not have to go somewhere else. You love to integrate and you are good at it. Others aren’t. And they do not want to say that someone else does it better than they do. Its human nature and its not bad business. Google really does not want you to use Yahoo’s calendar and Yahoo really does not want you to use Google’s email. And while they kind of work together they really don’t. And never will. The other reason is the constant catch up that is required when one operation makes changes (to improve their service) and it affects the use of the integrated operation. Consider that twice Yahoo mail attachments have not worked right when your browser is Firefox until Firefox found out about it and upgraded. Messy. I used to enjoy the process as well as the outcome. Increasingly I’m bored with the process, but I continue to value the outcome. And the reason I’m bored with the process is that it always involves jumping through hoops that are, from my perspective, unnecessary. It would be trivial for Facebook to take feeds from Flickr and Eventful, and source those photos and events into its native apps. Nobody would have to be “good at integration” to accomplish that. Of course. So Facebook wants me to be present for a certain style of casual interaction, and LinkedIn wants me to be present for a certain style of business-oriented interaction, and I’m willing to be present in those networks for those purposes /if/ they can leverage and enhance my life on the Net. They do, however, still both use standard Internet email, rather than assuming that you’ll only want to converse with others in a Yahoo or Gmail walled garden. Mugshot http://mugshot.org/ is basically all about aggregation, but also with a client-side app that keeps you up-to-date on what your friends are doing. Personally, I’m not going to bother with Facebook until it a) becomes an juggernaut b) it opens up its walled garden so those without accounts (including search engines) can look in. I presume that you are referring to RSS style ‘feeds’. This ties into the first quote which is really a plea for ‘standards’. RSS is a ‘standard’ that can be used for certain kinds of interaction and they are easy and work well. I use the Tunefeeds portion of Faces.com to listen to music and it appears in my myyahoo.com homepage. It just works, which is what you are suggesting and I certainly agree. But everyone does not offer this kind of capability. I suspect that it will, however, increase. Enjoy. And Happy Father’s Day. p.s. If I hadn’t enlisted I’d have graduated ’72. You and I are “of an age”, good sir! The CHS numbers are higher than you think-and lower. I believe the ’07 class had less than 400 students. OK thanks. Meanwhile, the # of CHS ’74 classmates on Facebook has grown from 5 in June ’07 to 48 today. Next Next post: How do I know this person? Through the Web!